Well this will be my last update for a couple of weeks, as I am off to Europe for some well-earned R&R > even if I do say so myself. It has been an eventful couple of weeks since my last entry, I have met many wonderful new producers, secured a rather significant endorsement, participated in the final inspection of the possible ark and survived my first Israeli airstrike. On Tuesday night Israel launched its first airstrike on Gaza since the November ceasefire and my arrival. I became aware of the strike via twitter when I started reading unconfirmed reports of several Israeli attacks in the North and East of the Gaza Strip. The information coming through was confused and suggested that their where F-16 and drones thick in sky over the port area, where I live, so I ventured outside to see for myself. However I struggled to hear anything over hum of the night here in Gaza, aka the generators that power most of the buildings in the Almenia area where I live. I then returned home to check for media updates and found that Haaretz had confirmation of the attacks, which it stated where in response to Palestinian rocket fire. Interesting how Israeli attacks are almost always reported as responses, when reported at all, but Palestinian attacks are never framed in the same way ??? Take the November ceasefire for example prior to the Tuesday nights events there have been over 100 Israeli violations of the agreement, that have left four Palestinians dead and scores injured, yet in all the articles I read in the western media on the topic nowhere did I read “the Palestinian rocket fire was in response to over 100 Israeli violations of the ceasefire agreement”. It seems Israel’s and the west’s idea of a ceasefire between the Palestinians and the Israel, is that Palestinian resistance stops, while Israeli oppression is allowed to continue unabated. On a more positive note I now have 14 new producers on board with the Gaza Ark project, excuse the pun, whose products will be available in our second release of products coming soon > http://www.gazaark.org/products/ . The project now has a good variety of products to choose from agricultural goods, arts and crafts, carpets, furniture, Jewelery, pottery and even organic cleaning products. However unfortunately, but as expected, they all had stories of difficulties they now face due to the illegal blockade. Confirming the importance and the need for the Gaza’s Ark project. Weather its difficulties getting the raw material need for manufacturing or the stories of unemployment caused by the lack of access to exports markets. 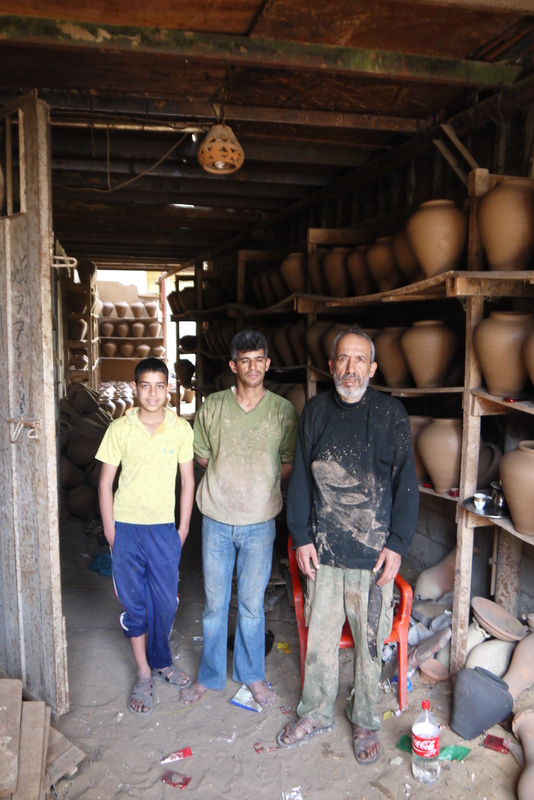 The story of Mahmoud Attallah and his two son’s who have a pottery factory in the Old City in Gaza has stay with me all week. Mahmoud has had to lay off his entire workforce due to the blockade, as his factory prior to the blockade used to export the majority of their pottery to Israel, Saudi Arabia and the United Arab Emirates. He and son’s now struggle to keep the business going on their own and to make enough to even support their own family. His is a factory that used to support over ten families and now barely supports one. This story is common in Gaza and shows clearly the indiscriminate nature of the blockade and the collective punishment that it enforces in violation of international law. This week also saw the final inspection of the possible Ark, all that remains now is for the Steering Committee to approve the inspection report and for the Gaza’s Ark financial officers to sign on the doted line. On the endorsement front, I secured a rather significant endorsement of Gaza’s Ark this week. However due to the media teams decision to embargoed this and all future endorsements I can not tell who the endorsement is from, but lets just say I am rather chuffed about it. The decision about placing an embargo on the endorsements is so the project can make the most impact with them, through carefully timed media releases. In addition to this I have been working closely with the Palestinian General Federation of Trade Unions [PGFTU] on a letter writing campaign between the PGFTU and their international comrades in support of Gaza’s Ark. Here is the link to the first general letter from the PGFTU to their international brothers and sisters > http://www.gazaark.org/2013/04/02/letter-of-support-from-unions-in-gaza/ . However going forward there will be specific letters from the PGFTU to specific unions internationally to increase awareness of the situation here in Gaza and the importance of the Gaza’s Ark project. As my first tour of duty draws to a close the main reflection I have of my first two and a bit months in Gaza is that I hear the word “only” way to often here. “Only’ one person was injured in last nights airstrikes, I “only” spent two years in-goal in Israel, I have “only” lost one family member to the occupation forces > what the Palestinians of Gaza have had to put up with and become accustomed to is completely unacceptable, when will the rest of the world see this ?? ?